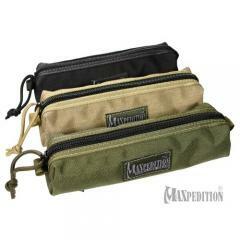 Carry all your oddly shaped items conveniently and securely using one of Maxpedition's Cocoon Pouch. Designed to hold long items that do not fit in pockets or waistpacks, these carriers are a lifesaver for frequent travelers. Measuring eight inches in length, this carrier is ideal for everything from knives, to flashlights to toiletries. Loops throughout its interior offer secure tiedown points for loose gear. Full-length zippers provide users with total access to contents. Its tough rugged military-grade nylon body is weather and abrasion resistant so that the cocoon pouch can be taken anywhere. The pouch is compatible with ALICE/MOLLE modular platforms.